In many ways an animal's oral care is similar to a human's. It requires regular cleaning both at home and performed by a professional. It's possible to add years to your pet's life with proper dental care. 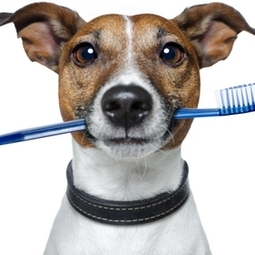 Dental hygiene can also increase your pet's health, vitality and wellbeing. Ultrasonic cleaning and scaling of all accessible tooth surfaces above and below the gum line are performed. Once your pet's teeth have been cleaned, you'll want to keep them in good shape. For the first week following a dental cleaning, you should give your pet soft food while the gums heal. After 7-10 days you should start a program of brushing your pet's teeth. A toothpaste made for pets should be used. Gradually introduce the brushing program and work up to an every other day schedule. Edwardsville Animal Clinic celebrates dental month in February by offering a forty dollar savings on all dental cleanings. Please schedule a complimentary dental consultation for your pet prior to scheduling for a dental cleaning for a treatment plan and an estimate. Dental radiographs are performed on your pet during the dental cleaning procedure. Dental x-rays help diagnose many conditions that may otherwise go unnoticed. For example, dental x-rays can help the doctor discover fractured or broken roots, cysts, tooth resorption, early tumors, or unerupted teeth. X-rays can reveal teeth that are unknowingly compromised on the inside. Periodontal disease can be staged and addressed by examining the dental x-rays for bone loss around tooth roots. Don't delay with tooth decay, schedule your appointment today!